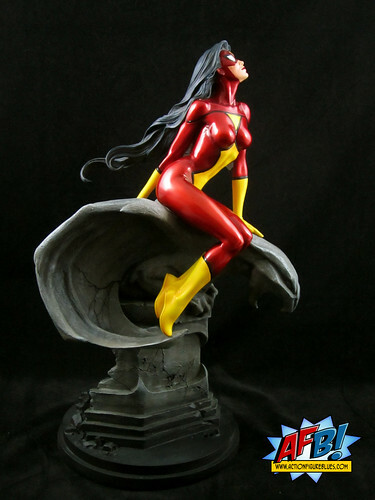 I normally review items in the order I receive them, but tonight I’m letting Bowen Designs’ Spider-Woman Statue jump the queue, because it’s simply too beautiful a piece to have to wait! Having come into full on Bowen statue collecting (as opposed to just busts) a couple of years ago now, I have back-collected quite a number of pieces that came out before I started buying, but one I’ve never been able to pull the trigger on was the original Bowen Spider-Woman Statue. There’s something the pose that I always found a but off-putting. I really wanted Jessica Drew in my Full Size Bowen collection, so I was very pleased when I saw the solicits for this new version and decided this would be the one. This is a very happy review, but it starts with a bit of a sad tale. As I was unpacking this statue from it’s mailer and Bowen box, I heard the last thing that any statue collector ever wants to hear - a rattle. I opened the box, a feeling of dread rising in my stomach, and sure enough, I found Spider-Woman’s right forearm floating free. I have to say other companies do a better job of providing padding for statue sections that can’t be snugly packed, and this was definitely needed here. Thankfully, it was a clean break at the glove line, and I was able to super glue the piece on very easily - crisis averted. That little hiccup aside, this is a very exciting piece to add to the collection. Mark Newman is definitely up there on my list of favourite sculptors, and he has knocked this piece out of the stratosphere. Bowen does a great job with standing poses for its “museum” style statues and more dynamic poses for its “action” pieces, but it’s nice to see them do something that doesn’t really fit in to any particular niche, and this piece certainly fits that bill. In this design, Spider-Woman sits on a very beautifully designed gargoyle, and the result is captivating. 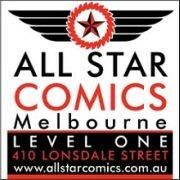 You can never be sure how something that looks great in photos is going to look on your shelf, and I wasn’t sure from looking at the preview shots how this would play once I saw it in person, since angles from promo shots can often be deceiving. Thankfully this piece looks just as great in my display as I did in the preview shots, and the angles as photographed match what one can achieve when displaying the piece. One thing I really like about this piece is that it works well at different angles. It can be displayed with Spider-Woman facing straight-on, to the left or even from behind. I have a feeling I am going to be rotating this statue in my display regularly just to enjoy the different effects! 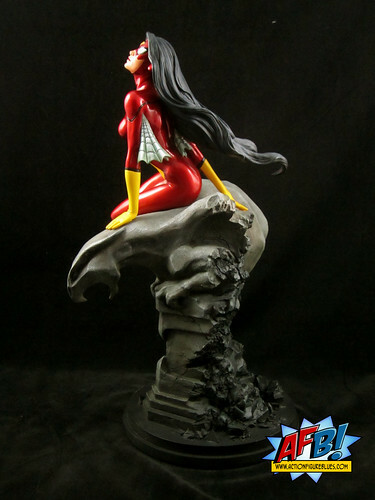 The figure of Spider-Woman herself is a beautiful piece, and I love the way that she’s posed. It’s a relaxed, contemplative pose, but at the same time very powerful if you imagine her sitting on this gargoyle at a height overlooking the cityscape. As well as the classic costume and lines we’re used to, I particularly like the flowing way her hair is sculpted, and this is one of the effects that makes the piece work when viewed from the back. I also like her little spider-wings sticking out at the back. They’ve been sculpted and painted in a way that gives them a sense of texture and flow in contrast to the more “solid” aspects of the sculpt. While Spider-Woman is the headline act here, the gargoyle she rests on is in itself is a really amazing piece, with an amazing level of detail. It’s been finished off to look exactly like an old stone outdoor statue, including cracks of age. Even more impressive, and another argument for displaying this back to front, is the damage at the back, where the gargoyle is crumbling to intricately sculpted rubble. This is the fruit of a master sculptor at work, going the extra mile to challenge himself as much as impress the viewer. When this was first being discussed, Randy Bowen presented both flat and metallic painted versions of Spider-Woman’s costume. While the flat version is more comic-accurate, I have to say I’m very pleased with the choice of metallic, as it gives this piece a sense of life in person that I think is part of what I found lacking in the original Bowen Spider-Woman statue. This has been an absolutely bumper year for Bowen, with this amazing statue coming in the wake of stunning pieces like Valkyrie, Banshee, and the stunning M.O.D.O.K.. I hope to see more Bowen work from Mark Newman, and more statues that are conceptually outside the box like this lovely Spider-Woman piece, which I expect to be a centrepiece of my collection for a very long time. That is just so nice.